California Fireball Meteor +19'42 PDT 17OCT2012 - Fragmentation and Sonics! Meteorites! 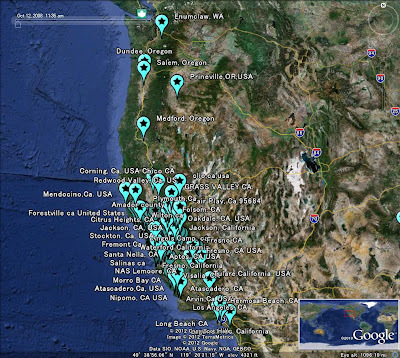 MBIQ indicates that a meteor was seen minutes ago over California on 17OCT2012 at 07'42 pm. 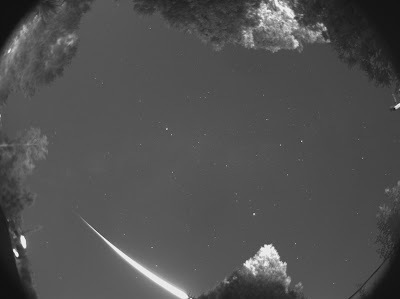 The meteor appears to be slow-moving sporatic fireball meteor and NOT related to the Orionids meteor shower. The meteor fragmented with sonics and is a very good candidate for a meteorite producing event! Go find the meteorites! Please check security cameras in the area for capture of this event. If you witnessed this event please file a sighting report on this site; thank you! IF you would like me to share Meteorite Fall Data concerning this or OTHER meteor cases please sign up for DROPBOX. (If you have Google Earth please kindly help by testing this kmz delivery link California KMZ V1wS incompleted via DROPBOX. ; feedback appreciated. Over 25,000 readers found this post; thank you all! Please bookmark this site and comeback. Please tell your friends about this site. 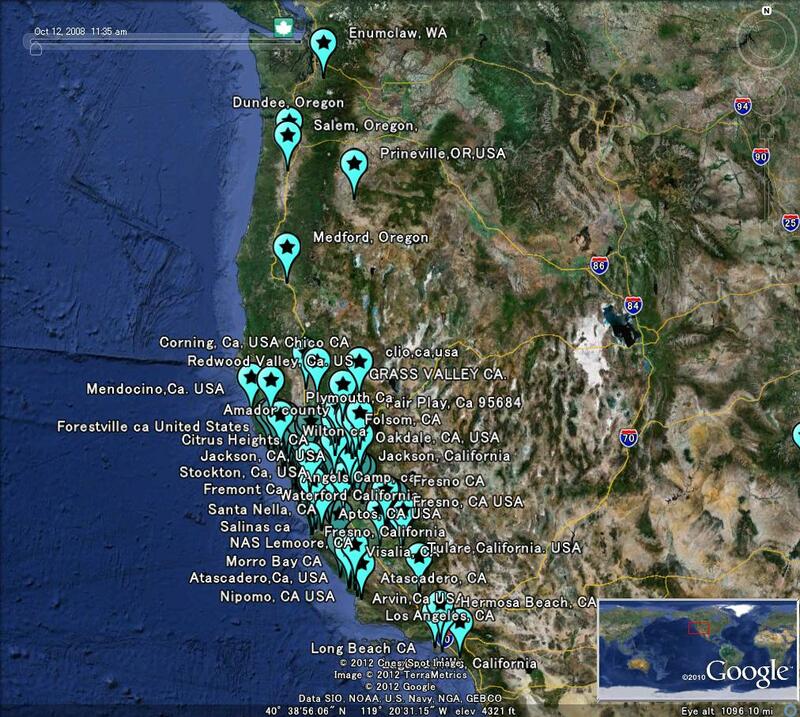 Sonics Reports for 17OCT2012 California Meteor Event at 07'42 pm PDT. Raw footage of meteor breaking up over San Jose captured by our security camera from the Lick Observatory. Starts at 00:42. Round structure to the left is the 40 inch Nickel refracting telescope dome. Lights in the background are from the San Jose cityscape. CHP and local San Mateo County police radio traffic about a meteor in the San Francisco Bay Area meteor on October 17, 2012. Meteor Fireball Streaks Over Northern n CaliforniaSkies! A large bright object seen in the night sky all over the Bay Area had everyone talking. Latest details on the object in the sky and our upcoming meteor shower with Chief Meteorologist Jeff Ranieri. 17OCT2012 peter hopper san jose, CA, usa 20:45:00 6 - 8 seconds From North to West Bright White whiter than the sun. As bright as the sun. But smaller. broke into two after 5 secs. Looked like it hit in Milpitas.. or silicon valley, east bay foothills. 17OCT2012 Chris Merced, Ca 19:50:00 10 sec Left to right, South to North White and then Green, no sound. I don't know what it was. white with a white tail fallign fast. Then end part was green, first par twas white. it appeared to split into 3 pcs. Same as if not brighter than moon. Thought it was a firework. But it was something distant. Yes, as it fell down and across the sky it fell into 3 pieces and vanishes out of view. Very shocked, I want to know if anyone else saw it as well. Thank you. 17OCT2012 Marisa Santa Rosa, CA, USA 19:45:00 30 sec Facing south going from sw to ne Bright white to red Bright as headlights Sparking off red towards the end Amazing! 17OCT20912 James Turk Scotts Valley, CA, USA 1946 PDT Approximately 4 seconds. Started near center of sky, and stopped at about 1/4 of sky away from northern horizon. Traveled south to north, or left to right from my vantage point. I was facing west. Fireball started out yellow, then flashed to a brilliant white before breaking into numerous smaller parts, each with their own yellowish fireball and trail. The main trail was greenish in color and extended behind the head for about 1/4 of the sky. I did not hear anything. Brighter than Venus, but not as bright as the sun. Yes. As the object traveled north, it broke into multiple smaller fragments. This was the biggest meteor I have ever seen, and I'm 63 years old. 17OCT2012 kelly and amy Santa Cruz CA 19:50:00 5 seconds West to East bright orange/red/white with green in the tail very bright, like fire works yes Looked up and saw what I thougt was a huge fire work in the sky, but it was traveling fast. Very bright, very big. 17OCT2012 Joan C. Fresno, CA 1955 5 seconds SW to North Gold/yellow to bright green Moon Looked intact and just got smaller and disappeared I have never seen anything like it, amazing! 17OCT2012 Robert Ludan Carmel, California ISA 19:50 PST 5-10 seconds S-N Yellow/orang fireball moon Material dropping off tail Appeared to be very low altitude. San Luis Obispo, California arrived from google.com on "Latest Worldwide Meteor/Meteorite News" by searching for california fire ball october 17 sky. 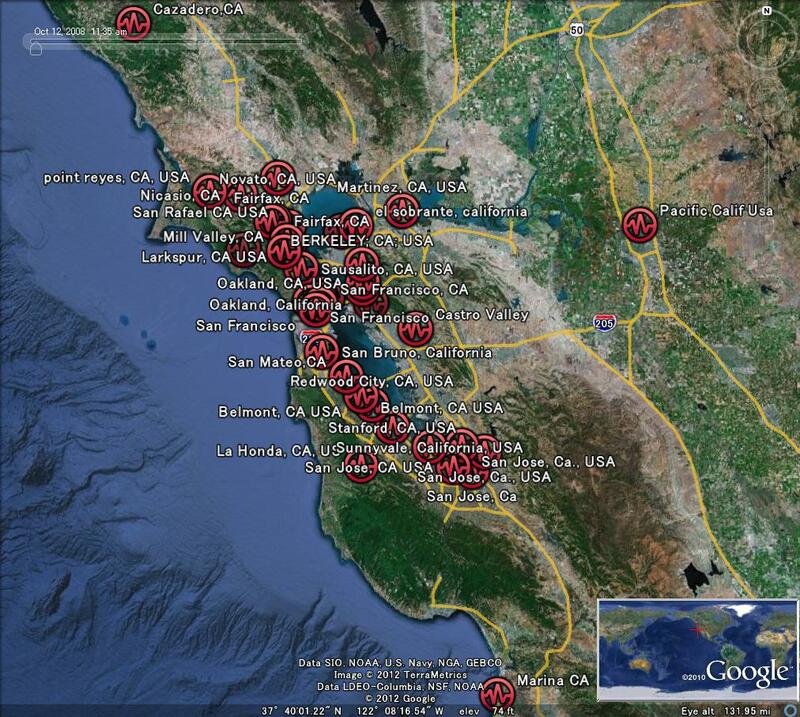 Oakland, California arrived from google.com on "Latest Worldwide Meteor/Meteorite News" by searching for meteor. Seaside, California arrived from google.com on "Latest Worldwide Meteor/Meteorite News" by searching for meteor falling today. Riverbank, California arrived from google.com on "Latest Worldwide Meteor/Meteorite News" by searching for mediorite california october 17th. Roseville, California arrived from google.com on "Latest Worldwide Meteor/Meteorite News" by searching for meteor fall . San Anselmo, California arrived from google.com on "Latest Worldwide Meteor/Meteorite News" by searching for do shooting stars have green tails. Pinole, California arrived from google.com on "Latest Worldwide Meteor/Meteorite News" by searching for meteor tonight in cal. sky. El Cerrito, California arrived from google.com on "Latest Worldwide Meteor/Meteorite News: Lexington, KY Orange-red Meteor Fireball 25JUN2011" by searching for orange red meteor. Santa Cruz, California arrived from google.com on "Latest Worldwide Meteor/Meteorite News" by searching for saw a meteor tonight. Pleasanton, California arrived from google.com on "Latest Worldwide Meteor/Meteorite News" by searching for shooting star october 17 2012 california. Fresno, California arrived from google.com on "Latest Worldwide Meteor/Meteorite News" by searching for fireball falling from sky 2012. San Jose, California arrived from google.com on "Latest Worldwide Meteor/Meteorite News" by searching for meteor seen today. I made a mistake with the date--It was the 17th not 16th. I seen it wow i didnt know what i was seeing but i know it was deep. But going off your post thats what i seen. Wow first time ever seeing one live. I tripped on how it just vanished after it like exploded. Just imagine you looking at a clear night sky filled with bright stars and suddenly you see one of the stars moving at a very slow pace and does not leave any sort of light/dust trail behind but just continues to keep moving across the horizon. 17th night, on a friend (Deep's) birthday 4 of us lucky guys got to see a slow moving, very bright white light across the night sky near the Himalayan range at around 4 am. We were sitting by the River Parvati and enjoying the clear skies and fresh air and suddenly we see the magic happen. We thought it could be a shooting star but it was too slow to be one. Then we thought it was a satellite, but it was too bright to be one. We then thought it could be a UFO, but aliens like to be around Mexico, America and Russia. So it had to be a Star, a slow moving star. I call it SMS - Slow Moving Star, but am not sure if one exists. Is there any expert/ knowledgeable person out there who could suggest what that could exactly be.